The "Empyrean people" Zapotecs were living at the territory of contemporary Mexica in first millennium BC. They possessed unique knowledge in various areas of science and art. Unfortunately there are only ruins left from their main cities, but those are enough to set their civilization at the same level with egyptian. Medicine, astronomy, melioration where they were pioneers in usage of dambs and channels, and unique writing system and poetry - that is the investment of Zapotecs to the culture of pre-colombian America. Magical practices of this ancient nation are also interesting, they are partially described in the books by Carlos Castaneda. Zapotecs were peaceful people praying to the natural forces and animals, in their sculpture and painting you could encounter numerous images of jaguars, american lions. 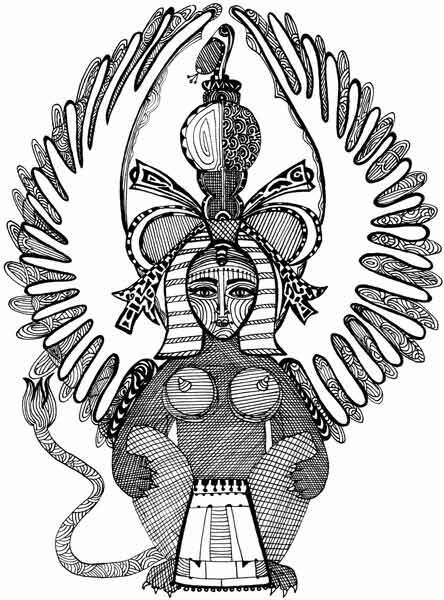 I have imagined that Zapotec priests travelled to contemporary to them Egypt, I have combined image of sphynx with elements of their classical culture.